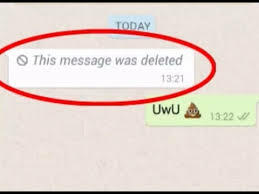 WhatsApp has the "Delete For Everyone" feature that makes it easy to delete messages you did not intend to send to the other user. For text messages, this recall is easy, but what about Video, Photo or other message resources? In Android, whatsapp messages and resources get saved on the device. Is that deleted too using unlink function that is available in many *nix platforms? Anyone who did static analysis care to comment? Does delete for everyone feature on WhatsApp work for videos or pictures which were already downloaded by the recipient on their phone? No, If the person has backup to Google Photos or Drive option enabled for their WhatsApp the photos does not get deleted even if you delete it for everyone. It remains on the cloud. However if the backup to cloud option isn't enabled the photo gets deleted from the recipients smartphone too even if downloaded! So unless there is a better and/or updated answer with newer versions, will just have to take this one. Not the answer you're looking for? Browse other questions tagged android messaging reverse-engineering or ask your own question. If someone says Android message API what it related to? What classes it consists in? When I should I use message passing over shared memory? When learning Android, should I focus on the latest and greatest? What are the implications of the cache when using notifyDataSetChanged? If I develop a media player for mobile or desktop do I have to pay for a license if my player is able to read MP3 files? How does an app send an order to a retailer? What happens under the hood?